This is the trail connecting Duvanjsko field and Blidinje Nature Park. 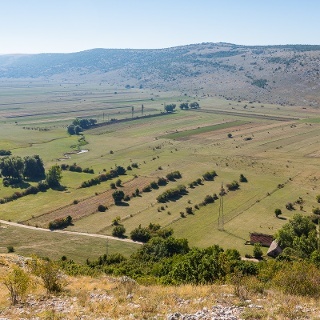 It is less known as a hiking area, but there are great views of Duvanjsko field, Vran, and Cvrsnica mountain. In its first section, the trail crosses Duvanjsko field and comes to the village Omolje. From Omolje it climbs up to Orlovkuk and Lib mountain where it continues towards its north ridge shared with mount Svinjar. 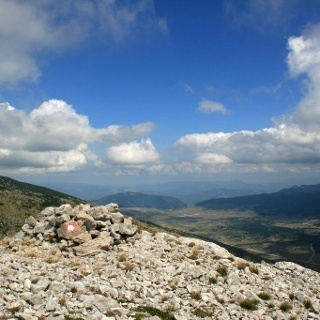 From the summit of Svinjar, the trail descends down to Svinjaca's end on the road to Blidinje and continues on the other side of the road towards Vran mountain. It is worth mentioning that the north ridge of Lib leads to an ancient Iliryan capital that was called Deliminium. There is not much to see on the spot, but it is good to know that once upon a time it was the main centre of Dalmatian tribes. Contact local club Eagle's Rock from Tomislavgrad, espacially if you continue your journey over Vran mountain. Mind your steps as some sections go over trailless terrain. Sturdy boots and standard hiking equipment. Hat is a must during the hot summer days. Follow the road towards Posusje and look for a sign and road going to Duvanjsko field. After a couple of kilometers you need to turn left onto a less developed road. Follow that one to the end and cross the bridge after the graveyard. Cross the asphalt road in Omolje, follow the street to the end and go right after blazings. The trail goes towards the right and up to a small forest, where it turns left towards Orlovkuk summit. On the crossing, you need to turn right towards Svinjar (in the direction of Cvrsnica mountain) as the other trail will descend down to Borcane and Grla valley. After crossing an interesting valley with steep walls, the trail heads towards north ridge and follows that to Svinjar, and down to Svinjaca. Cross the road at Svinjaca and continue on marked trail in to the pine forest. At the crossing turn right towards Omar. Omar is the next open area with a small green house. From Omar follow the road to Omrcenica. 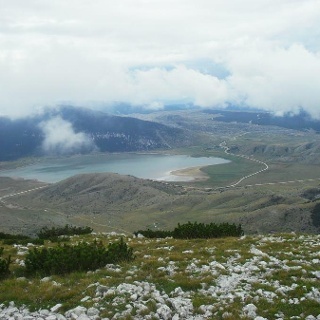 From Tomislavgrad towards Posusje (Mostar) or from Posusje. The trail head is about 3 km after you reach Duvanjsko field. You can also start from Omolje that can be reached from Crvenice (look for the sign before approachiing Duvanjsko field) or Tomislavgrad via Mandino selo (right after fuel station). Check the guesthouse Lovre, or some other private houses. 14 planinara PD "Konjuh" iz Tuzlee i 1 planinarka KES "Summit" iz Banovića planinarila je ovom etapom. Tura je duga i zanimljiva. Najveći nedostatak je markacija koja se često gubi pa se troši vrijeme na pronalaženje iste. Possebnu pažnju treba obratiti na odvajanje staze za vrh Svinjar jer markacija nije vidljiva. Potrebno je obnoviti markaciju na početku Vrana sa Svinjače jer je izgradnjom novog šumskog puta ista potpuno uništena, a ima dosta odvajanja. Prreporučujem korištenje navigacije. Svu potrebnu pomoć možete dobiti od susretljivih i prijatnih članova PD "Orlova stina" iz Tomislavgrada. Do not rely on water under Orlov kuk in dry season. There was no water in the stream and Klisac spring is inaccessible under concrete block (we could hear water, very frustrating). Good camping spot with picnic table (close to the "stream").